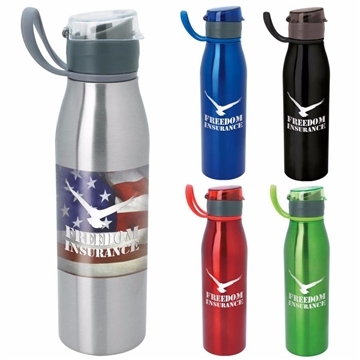 Great for the gym, hiking or any sporting event. 25 oz. capacity when filled to the rim. Overall Reviews: WRITE A REVIEW (16)5.005Spectra Bottle - 25 oz. Logo Quality very good. No real complaints. No complaints at all. These were precisely what I was expecting. the quality of the design was great, our logo look nice. I was very impressed with the color and the logo. I was hoping that it would have been a little cheaper but overall they are great! The color turned out to be great. The greatest advantage is that the order was processed rapidly after I provided the logo design. The feedback from employees continues to be excellent! And in reality, their opinion is the only one that matters.